Ever wonder what your pet is thinking? As an empath, Rita, happily receives communication from animals—including her beloved Boston Terrier, Punim. She loves sharing insights and encouraging others to reach joyful communication. Rita's first 'telepathic' experience that she remembers, happened in an amusement park with a tank of dolphins the weekend before opening their exhibit in Houston. The 2nd time she was in the Florida Keys and two of the dolphins at the hotel were being transported to Michigan to be an attraction at an Aquarium there for the summer season. It was an annual event that the animals had experienced before. This time the dolphins were not having it and made it extremely difficult for the handlers—so that they quit and said they'd have to try again the next day. That evening, while Rita and her husband Sutton were enjoying a quiet time with a friend looking out over the lagoon with the dolphins Rita began channeling—an energy that called itself Rama, there to speak to the animals directly. She was amazing and couldn't deny that this was on purpose. 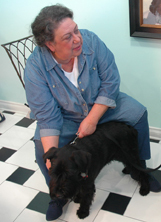 She now offers an opportunity for greater understanding with your animal companions. Now is the time to find out what they have to say. 10-minute readings are available for $15.00. Readings are available online, by phone, or in person. If you have questions, please contact Rita. Read "Channeling Edward," an article by Sam Bennett about my reading of his dog Edward, published in the Lake Oswego Review, Dec. 13, 2007.